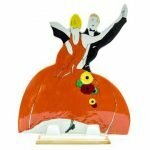 After Clarice Cliff, a Wedgwood Age of Jazz figure, shape 433, made 1996, designed 1930, number 25 of 200, with certificate, 21cm high. 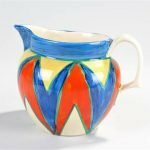 Clarice Cliff Bizarre jug, Newport Pottery, the hand painted jug decorated with yellow, blue and red geometric design, 12.5cm high. 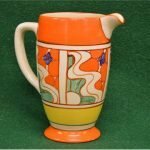 Clarice Cliff Fantastique hand painted jug decorated with orange, blue, yellow and green pattern – 7″ tall. 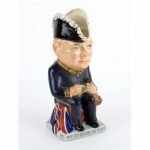 A Clarice Cliff Toby jug of Winston Churchill for Wilkinson Ltd modelled as Churchill in full naval uniform seated on a bulldog, holding a battleship, upon a square base entitled ‘May God Defend the Right’, No. 239, with printed marks to base. 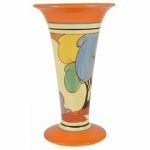 A Clarice Cliff Autumn Fantasque Bizarre trumpet vase, 20th century, painted in colours of black, mauve, blue, yellow, green, black marks to base. 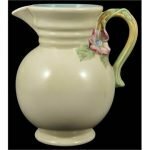 A Clarice Cliff cream ground jug, the ribbed neck above a bulbous body with circular foot ring and with floral twist handle, No.895 and printed marks to base. 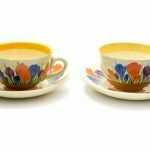 Clarice Cliff for Wilkinson and Newport Pottery, two Crocus pattern tea cups and saucers, Bizarre marks, one cup marked for Newport. 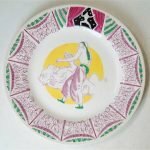 A Clarice Cliff Bizarre circular plate Designed by Laura Knight A.R.A, decorated with a circus performer with a lion within a circular tent border, 1st edition circa 1934. 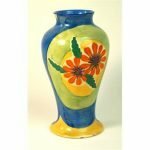 A Clarice Cliff Bizarre vase of inverted baluster form Decorated in the ‘Blue Ribbon’ pattern, printed factory marks to base. 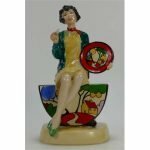 Kevin Francis Peggy Davies figure Clarice Cliff “The Artisan” in yellow and red colour way. 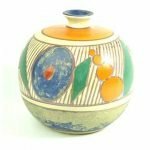 A Clarice Cliff Bizarre vase of shouldered cylindrical form Decorated in the ‘Rhodanthe’ pattern on a ribbed body, factory marks to base, height 21cm. 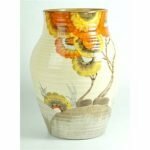 A Clarice Cliff Fantasque vase of bulbous form Decorated in the ‘Fruit’ pattern, gilt marks to base, height 16cm.